When I was a kid, I always liked breakfast cereal. Specifically sugar breakfast cereal. But my mom was a health food nut and wouldn’t but it for me. So I had to sneak behind her back and eat it at friends houses or hide it in my room. Then when she was not around, I would bring it downstairs and have a bowl of cereal. 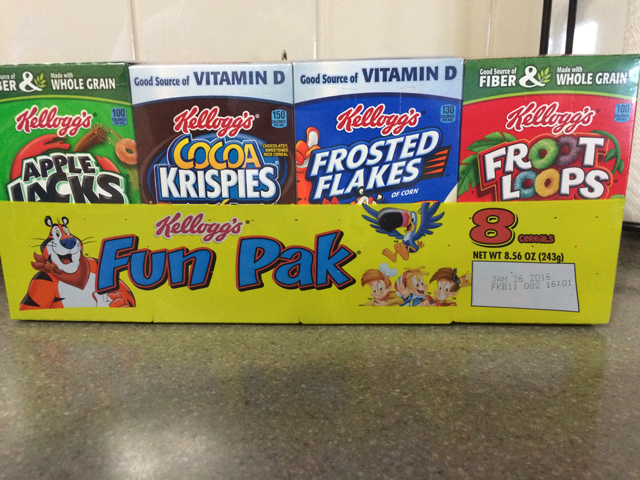 These smaller boxes made it easier to hide and sneak them into the kitchen. I much preferred the General Mills brand of the variety pack of cereals. These days, that brand is harder to find and when I do, they are not in boxes but pouches. 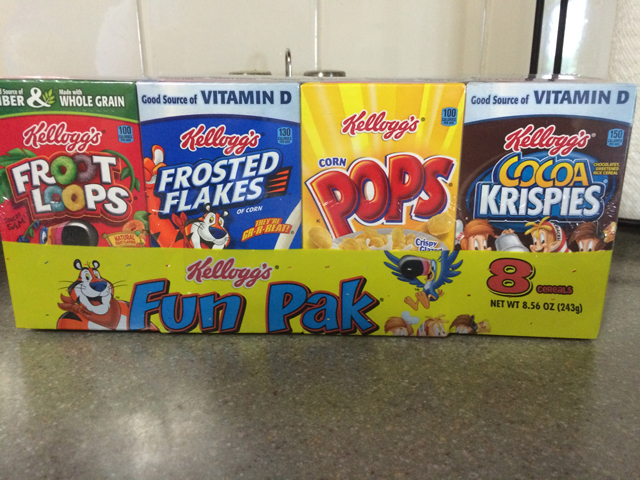 The Kellogg’s brand of these smaller single-serving boxes come with two of each of the following cereals: Cocoa Krispies, Frosted Flakes and Froot Loops. Then there are 1 each of the the Corn Pops and Apple Jacks. I devoured these pretty quick. Of course, these days, I don’t have any one restricting my access to sugar cereals. I eat them when I please and enjoy them whenever.